A lot of men worry about their weight increasing when they drink beer (particularly excessive amounts of the stuff) but is there any evidence that beer adds weight? In a word: yes. Beer does make you fat but it’s not a simple process like you’d imagine. 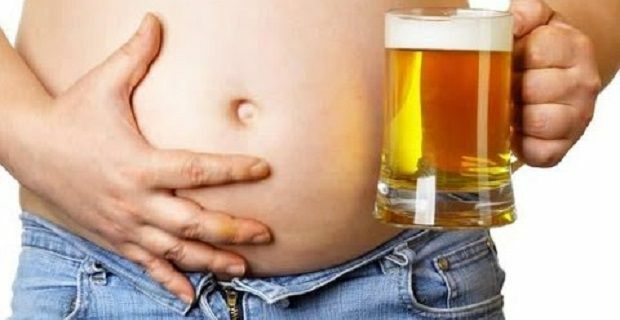 Here’s how beer adds to your waistline. Every time you take a swig of beer your body reacts to it in 20 seconds. That’s the amount of time the beverage takes to pass through your oesophagus and into your stomach. Around 20% of the alcohol content is immediately absorbed into your bloodstream from the stomach. The remainder passes into your intestines where it is absorbed. Then the alcohol travels through the bloodstream to the liver. At this point it’s broken down. During the breaking down process the waste products called acetaldehyde and acetate are produced. Stronger beers produce more of these things than weaker ones. The brain now tells the body to prioritise the breaking down of the acetate and acetaldehyde over the burning of fats. Unfortunately there’s a double-whammy with alcohol because it produces a waste product called acetyl CoA that starts making fat. Your body can process 15-30ml of alcohol per hour. That’s all. That’s not going to get your very drunk, is it? Basically the longer you drink, the more time your body will spend not burning fat, and the more acetyl CoA it’ll produce. To give you some numbers. A pint of standard beer is around 4% alcohol by volume. That means it contains 22.7ml of the stuff that gets you drunk. A night spent drinking 6 pints will leave your body with 136ml of alcohol to process. That means that it won’t burn fat for around 9 hours. Now read through this guide to the effects beer has on your body before you pick up another bottle of Bud.